Pittsburgh is home to one of the richest music legacies in America, and percussionist extraordinaire Roger Humphries has assembled a four-part tribute to some of our most influential artists. For the second in the series, Humphries and his band RH Factor celebrate the legendary pianist, arranger and composer Mary Lou Williams. 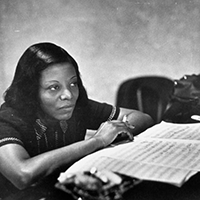 She has been called “perpetually contemporary” by none other than Duke Ellington, and recorded over 100 albums and composed and arranged for Ellington, Benny Goodman and Cab Calloway. This seasons concert series shares her most notable compositions, and takes audiences on a journey through our local musical history..
Part of Roger Humphries’ year-long community artist-in-residence. Made possible in part with generous support from the Advancing Black Arts in Pittsburgh Program, a partnership of The Pittsburgh Foundation and The Heinz Endowments.